Transforming a bare patch of earth into an attractive outdoor seating area can be surprisingly simple. A pebble patio is a firm surface, is free of weeds and mud, and can be built in one afternoon. The many options for pebble color and texture allow the patio to be built to match the decor of the house and surrounding landscape. Pebbles are a suitable surface for an informal patio area. A pea-gravel patio needs to be built on flat ground. So choose a location wisely to avoid having to excavate more than necessary to create a level pad. If, however, a sloped location is desirable for other reasons, it can be built in conjunction with a retaining wall to support the slope on the uphill side. Besides slope, consider other factors when choosing a location for the patio, such as ease of access from the house, privacy or best view of a garden. The project's first step is to remove all vegetation from the area where the patio will be built. If the area is relatively flat, smooth small humps and dips, and check whether or not the location has at least a 1-inch drop for every 4 feet of earth to facilitate drainage. If it has a significant slope, start digging at the high point, and spread the soil in the low-lying areas to create the pad for the patio. Use a tamper to compact the loose soil. A number of materials can be used as a border to hold the patio's pebbles in place. Bricks, cement blocks, natural stone or wood can be used with success. If a sloped area has been flattened for the patio, the border can double as a small retaining wall to support the loose soil on the downhill side as well as the excavated slope on the uphill side. Professional expertise is necessary to build a retaining wall that is more than 2 feet in height; excavating that much of a slope by hand to build a retaining wall of such a height is rarely feasible anyway. Minimize future weed growth by laying sheets of landscape fabric over the bare soil before spreading the pebbles. 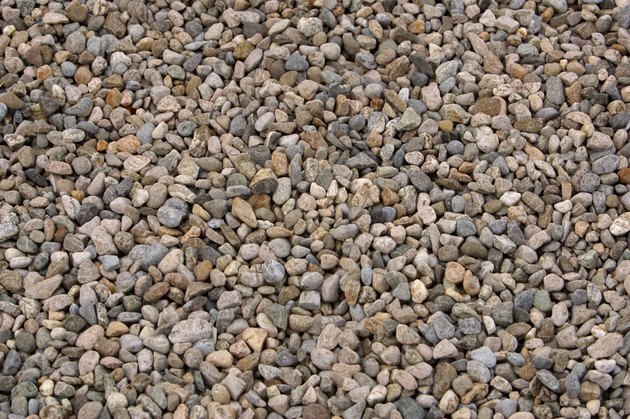 The pebbles should be spread about 2 inches thick and can be purchased by the cubic yard from a landscape supplier. Determine the quantity of pebbles to purchase by multiplying the patio's average width by its average length in feet to find the surface area that needs to be covered. Multiply the resulting value by 0.17, which is the equivalent of 2 inches of depth, to find the cubic feet of pebbles that are needed. Dividing by 27 converts cubic feet to cubic yards.